Brushing your pet's teeth can help keep their gums healthy. February is National Pet Dental Care Month. Dental care can be inadvertently neglected by pet owners, but is just as important as other aspects of pet care. Do you remember those funny red pills that your dentist used to give you when you were a kid that would show you all of the “stuff” stuck to your teeth that you had missed when brushing? That is an accumulation of food and bacteria called plaque. If left on the teeth, it eventually hardens into a calcified substance called tartar or calculus. 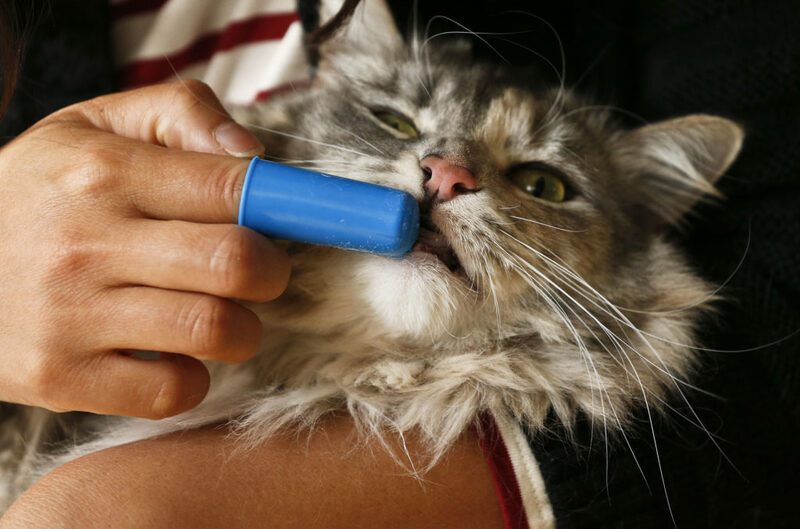 Because humans brush their teeth regularly, they don’t get tartar as often as pets. Unfortunately, animals don’t always receive regular oral checkups. Animals with dental disease can find it painful to eat and can develop terrible infections that cause bad breath. If infection in the mouth becomes severe, bacteria found on gums can travel through the bloodstream and lodge on the heart valves, where it forms nodules that result in heart disease. • When spending time with your pet, make a point of occasionally touching his or her mouth and examining the teeth and gums. In addition to giving you a good look at your pet’s teeth and gums, examining your pet’s mouth can get your pet used to having his or her mouth handled, which can make yearly checkups at your veterinarian’s office less stressful. While you are looking, you may also notice chipped, damaged or worn teeth that your veterinarian may need to check. • Brush your pet’s teeth. This can sound impossible, but toothpaste for animals is conveniently flavored in poultry and other meat flavors that many animals love. My own dogs love it so much that they will beg to have their teeth brushed. Animal toothpastes come with a small brush that fits on the finger and can be gently rubbed on the teeth. If you have been handling your pet’s mouth regularly, the process can be a pleasurable bonding experience for both of you. • Make sure your veterinarian does a thorough oral examination during your yearly checkup. Dental health should be part of every good physical examination, but it can be easy to overlook. • As your pet gets older, set money aside for dental examinations and cleanings. Having a professional cleaning once in a while can really improve the quality of your pet’s life, especially when they are in their golden years. Dental care is just as important to the health of your pet as other essential preventive care. Be sure to ask your veterinarian to do a thorough check for dental health the next time you are in for a checkup to maintain your pet’s happy, bright smile. — Jennifer Stone is the medical director and staff veterinarian at the Lawrence Humane Society.